Attenuation crates are a traditional way to build bespoke soakways or a method to store large volumes of water underground. Each system needs to be specified so please call Ian on 01733 405104 for more information. Various load bearing options are available. 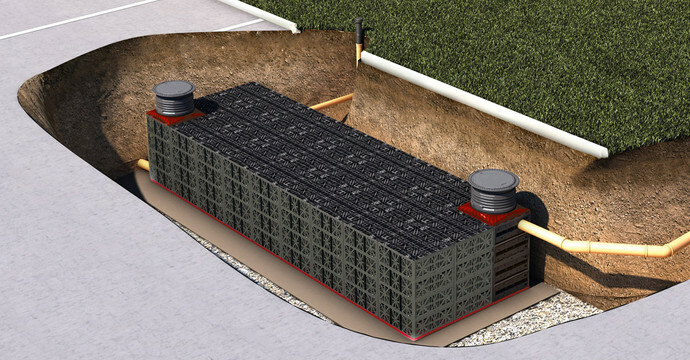 Infiltration modules have three times the storage volume of a standard gravel infiltration ditch. One module therefore takes the place of around 1300 kg (1,4 tons) of gravel or a 50 m (164′) drainage pipe. Since you don‘t have to excavate so much soil and enjoy great value for money compared with a standard gravel infiltration ditch, the modules save you hard-earned cash! A durable product design ensures sustainability. The EcoBloc system and the Vario 800 flex shaft system is designed for a service life of over 50 years. The EcoBloc light has a gross volume of 225 litres (59.4 US gal.) and a reservoir volume of 219 litres (57.9 US gal.). With a reservoir volume in excess up to 97 %, it is a market-leading product. The EcoBloc variants maxx and Inspect flex still offer a reservoir coefficient of 96 % despite their high load-bearing capacity. Even under very heavy loads, EcoBloc light modules can be installed at a depth of up to 4 metres (13’1.4″). This means that up to 9 layers are possible. Please consult Rainwater Harvesting Limited when the installation depth is greater than 4 metres. Drainage anti-flooding blocks or Flood Attenuation Bloc with 300 litre capacity for rapid drainage of land. Surface water is diverted or soaks down into weight resistant crates and from there dissipates slowly into the lower ground clearing water quickly from the surface. This model is HGV load quality and used for drives, car parks, pitches, lawns and areas prone to localised flooding. 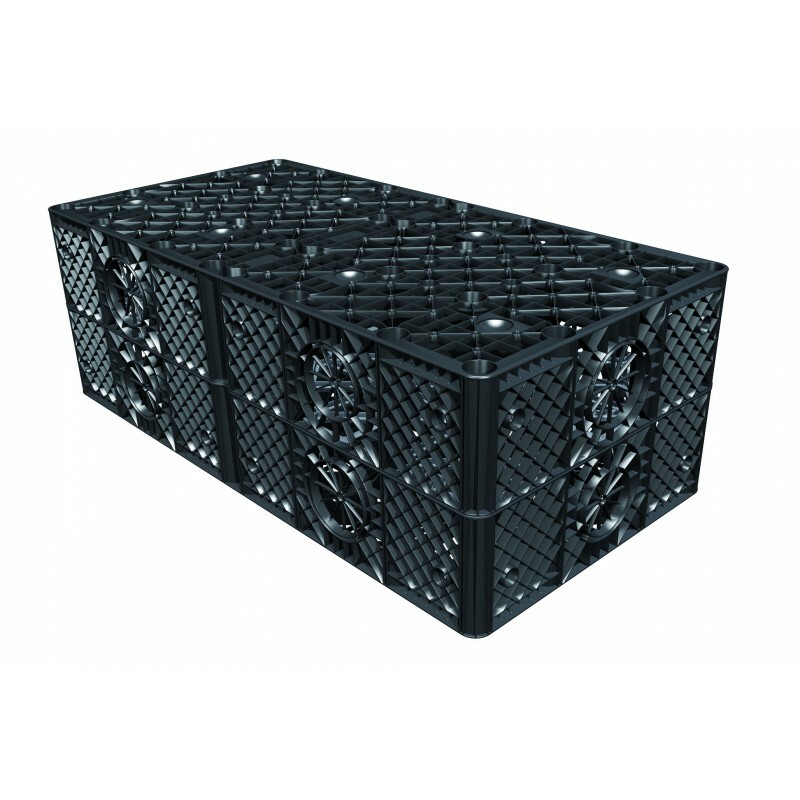 The rigid crates are made in black polypropylene (PP) and measure 1200mm (l) x 600mm (w) x 420mm(h) and will hold a maximum capacity of 300 litres gross or a working volume of 285 litres. To build the attenuation system, the blocks are connected together into a matrix. See the illustration. 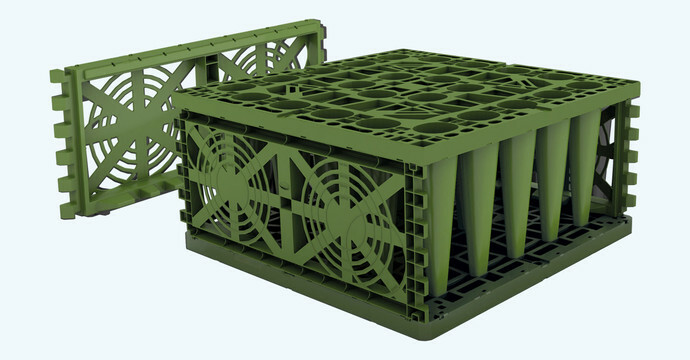 In areas where water storage is not a consideration, the crates can be wrapped in a geo-textile to slow the drainage of the water – forming in effect a large soakaway. 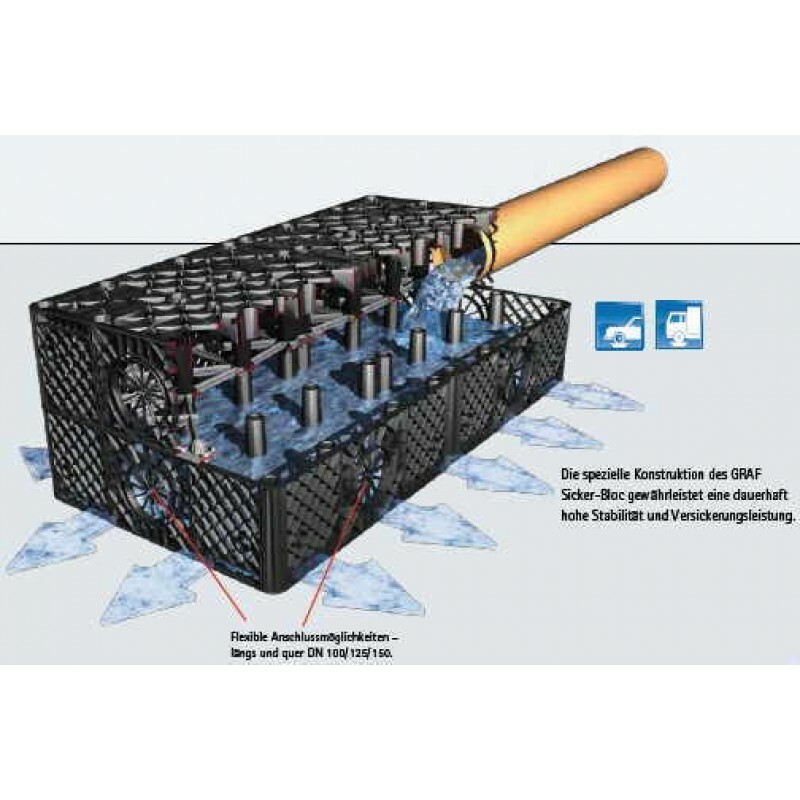 Where storage and reuse of the water is preferred, the block matrix is wrapped in a water-proof membrane forming a large underground tank that can be pumped for other use. Geo-textile and other membranes are available. 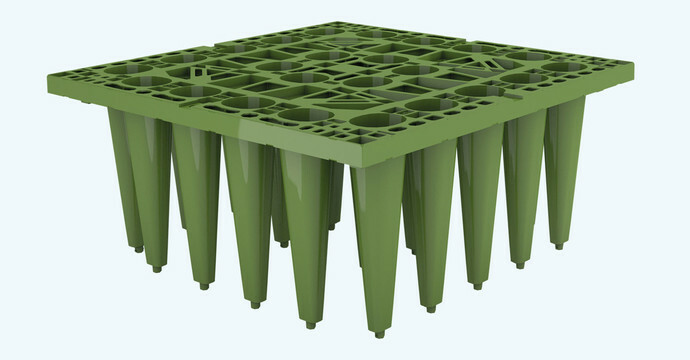 The Graf Rain Bloc can be installed in rows or block form, with 1 to a maximum of 10 layers, depending on the local conditions and the desired storage capacity. installing the module is easy, fast and variable. it can be installed without heavy equipment – a Rain Bloc weighs just 15 kg. The individual modules are connected using practical fast connectors.